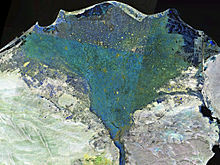 The Nile Delta (Arabic: دلتا النيل‎) is the delta furmed in Northren Egyp (Lawer Egyp) whaur the Nile River spreads out an drains intae the Mediterranean Sea. It is ane o the warld's lairgest river deltas—frae Alexandria in the wast tae Port Said in the east, it covers 240 km o Mediterranean coastline—an is a rich agricultural region. Frae north tae sooth the delta is approximately 160 km in length. The Delta begins slichtly doun-river frae Cairo.